Anime or manga centered around a singular girl with magical powers is a fairly standard set up, of course there is always some twist or facet that makes the story stand out on its own, hopefully at least. Red Data Girl finds its unique facet known through its name, deriving from the Red Data Book listing of endangered species, thusly implying the main character, and their magical nature, an endangered element of nature. This is an interesting way to look at the rarity of someone with such magical powers, but how well does it turn out in the end? Let’s see what the series has to offer. Right off the bat Red Data Girl clues in the viewer as to the namesake of the series, unfortunately it is through a wall of text title card, but it is pretty important so it will have to slide. From the start, the show makes an effort to show off just how regular the Izumiko Suzuhara wants to be with cutting her bangs to try and fit in better at school, since she already has to deal with her hair having been braided for much of her life. What she fails to realize though is just how important something as simple a trim can mean as she ends up finding out that she is destined to become the Himegami. The show very quickly sets how important the Himegami must be, but avoids giving any real detail as to what or who that is. This tendency to quickly cover information, but only after dragging it out over the course of an entire episode or longer. 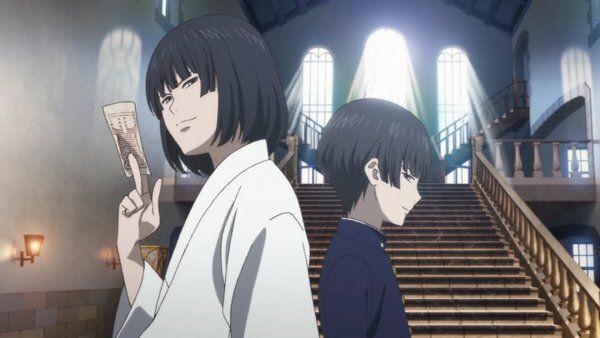 It ends up giving the series a feeling of being either the fastest slow paced show I’ve ever seen or the slowest fast paced show I’ve ever seen. From this dragging fast paced nature, Red Data Girl is able to introduce all the major characters by the fourth episode during which time the series has transitioned between two schools/school years. Despite this somewhat wonky fast paced nature the show for the most part never really seems to be moving at a slow pace, it seems to be going at a reasonable one as new ideas are introduced then suddenly they are being handled with lightning quick speed. More often than not being solved with a lot of Deus Ex Machina. 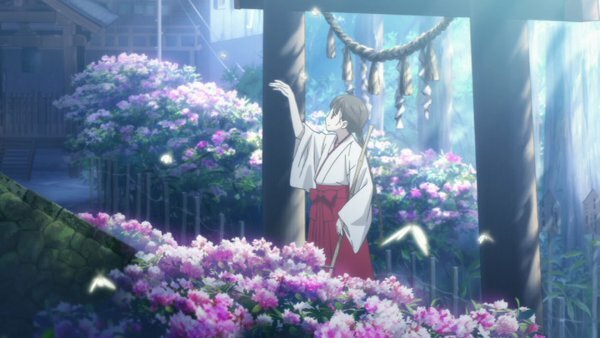 Being consistent or handling these issues may have helped Red Data Girl not feel so strange, but in the end this doesn’t really hurt the show at all, what ends up hurting it is that the show doesn’t really go anywhere. Constantly giving hints as to the true nature of what the Himegami could be just ends in nothing major really being resolved. The major conflict seems completely unrelated to the Himegami aspect of the show altogether, only being resolved by the fact that the main character is in fact the Himegami. There are so many more aspects that could really use some more exploration, but unfortunately never get their due justice as it is just a single 12 episode series. Looking at what the show does have though leaves a lot to be desired. 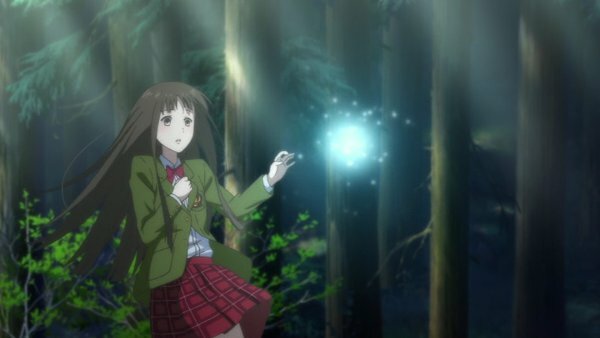 The visual look of Red Data Girl is very standard and unfortunately doesn’t offer much in terms of unique visual aspects, but does do some interesting stuff with some of the spirits that end up being dealt with. The ghost effects for a dragon and a winged man are probably some of the highlights, but there is also some nice detail put into the historical ghosts that the characters end up facing off against that also look very well done. 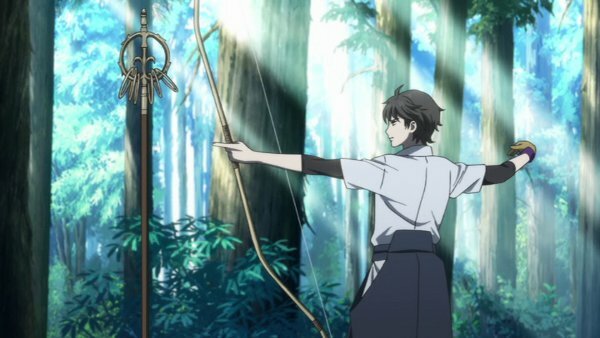 Though in the end with nothing too standout-ish the visuals just do a fine job reaching the expected quality of a modern anime. The voice acting in Red Data Girl is much like the visuals in that it doesn’t really go beyond to stand out. The voice acting is still deal adequately, the voices all fit the parts for both the original Japanese and the English dub, but it more or less toes the line without going above expectations. The only real highlight that can be found in the voice acting is the accent work done by the English cast for the foreign exchange students, which really says something when looking to that for a highlight. The music for the series matches up with the other elements, but again have nothing that stands out in ones mind during or after. Though they do tend to fit the scenes and themes just fine, so there are no complaints. Both the opening and ending themes share the common theme of love, but while the opening theme “Small WorlDrop” by Annabel highlights Red Data Girl‘s theme of being trapped within ones own destiny through a more upbeat style pop song, the ending them “Yokan” by Masumi Ito is a more somber tune also focuses on the theme of fitting in. 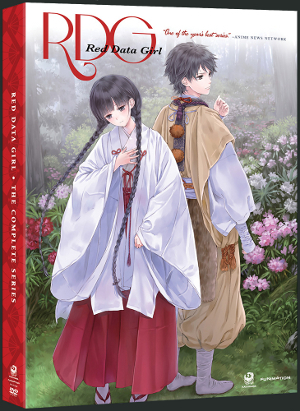 The extras offered in this DVD release is the usual for a FUNimation release, including commentaries by the English cast, textless opening and closing themes, and trailers for both Red Data Girl and other releases. This is somewhat to be expected however as a one season series there probably isn’t much in the way of additional features. In which case this offers at least a decent amount for what the series is able to provide. With an alright visual style, voice acting, and music Red Data Girl doesn’t stray too far to try and go beyond its means. The series does have a few interesting elements, but the problems are visible from the opening title explaining exactly from where the title derives. Plus the somewhat peculiar fluctuation between extremely fast and slow pace, that while never actually hurting the narrative makes the story seem like an awkward whirlwind that keeps the viewer guessing at what is going to happen next. While Red Data Girl only has a few stumbles the lack of anything done absolutely well makes the series only really fair as a whole, but not all that bad.